Lovely cup and saucer from Fire King. This is in their peach luster color with the Three Bands pattern from the 50’s. 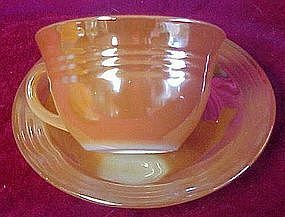 Both cup and saucer have the three ripple bands around the edge pattern. Lustere on the cup and saucer are excellent. Cup stands 2 3/8” tall by 4 5/8” long. Saucer is 5 3/4” across.